Short Poetic film by Nicolettecinemagraphics’ Matt Swift exploring the anxiety of a new creative technology and the pitfalls that occur when creativity becomes too easy and possibly leads to the need for other vices. The piece uses Edward Dyson’s 1917 poem My Typewriter as its point of departure to highlight in an age where typewriters are no longer seen as a convenience at one point in time they created the same anxieties we have in the 21st century with the over dependence on computers. 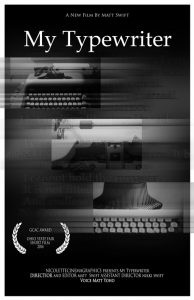 My Typewriter from Matt Swift on Vimeo.